Fort McMurray (/mɪkˈmʌri/ mik-MURR-ee) is a population centre, technically classified as an urban service area, in the Regional Municipality (RM) of Wood Buffalo in Alberta, Canada. It is located in northeast Alberta, in the middle of the Athabasca oil sands, surrounded by boreal forest. It has played a significant role in the development of the national petroleum industry. A severe wildfire in May 2016 led to the evacuation of its residents and caused widespread damage. Before the arrival of Europeans in the late 18th Century, the Cree were the dominant First Nations people in the Fort McMurray area. The Athabasca oil sands were known to the locals and the surface deposits were used to waterproof their canoes. In fur trade days the location of Fort McMurray was an important junction on the fur trade route from eastern Canada to the Athabasca country. In 1778, the first European explorer, Peter Pond, came to the region in search of furs, as the European demand for this commodity at the time was strong. Pond explored the region farther south along the Athabasca River and the Clearwater River, but chose to set up a trading post much farther north by the Athabasca River near Lake Athabasca. However, his post closed in 1788 in favour of Fort Chipewyan, now the oldest continuous settlement in Alberta. In 1790, the explorer Alexander MacKenzie made the first recorded description of the oil sands. By that time, trading between the explorers and the Cree was already occurring at the confluence of the Clearwater and Athabasca Rivers. The Hudson's Bay Company and the North West Company were in fierce competition in this region. Fort McMurray was established there as a Hudson's Bay Company post by 1870, named for Factor William McMurray. It continued to operate as a transportation stopover in the decades afterwards. The Alberta and Great Waterways Railway arrived in 1915 complementing existing steamboat service. The community has played a significant role in the history of the petroleum industry in Canada. Oil exploration is known to have occurred in the early 20th century, but Fort McMurray's population remained small, no more than a few hundred people. By 1921, there was serious interest in developing a refining plant to separate the oil from the sands. Alcan Oil Company was the first outfit to begin bulk tests at Fort McMurray. The nearby community of Waterways was established to provide a terminus for waterborne transportation, until 1925, when the Alberta and Great Waterways Railway reached there. Abasands Oil was the first company to successfully extract oil from the oil sands through hot water extraction by the 1930s, but production was very low. Fort McMurray's processing output gradually grew to over 1,100 barrels/day by World War II, and Fort McMurray was set up by the US and Canadian forces as staging ground for the Canol project. In 1967, the Great Canadian Oil Sands (now Suncor) plant opened and Fort McMurray's growth soon took off. More oil sands plants were opened, especially after 1973 and 1979, when serious political tensions and conflicts in the Middle East triggered oil price spikes. The population of the town reached 6,847 by 1971 and climbed to 31,000 by 1981, a year after its incorporation as a city. The city continued to grow for a few years even after the oil bust caused by the collapse in world oil prices. The population peaked at almost 37,000 in 1985, then declined to under 34,000 by 1989. Low oil prices since the oil price collapse in 1986 slowed the oil sands production greatly, as oil extraction from the oil sands is a very expensive process and lower world prices made this uneconomical. Oil price increases since 2003 made oil extraction profitable again for around a decade, until another slump in oil prices which began in December 2014 and deepened in 2015 resulted in layoffs and postponement of projects. On April 1, 1995, the City of Fort McMurray and Improvement District No. 143 were amalgamated to form the Municipality of Wood Buffalo. The new municipality was subsequently renamed the Regional Municipality (RM) of Wood Buffalo on August 14, 1996. As a result, Fort McMurray was no longer officially designated a city. Instead, it was designated an urban service area within a specialized municipality. The amalgamation resulted in the entire RM of Wood Buffalo being under a single government. Its municipal office is located in Fort McMurray. On May 3, 2016, a large wildfire burning southwest of Fort McMurray resulted in the mandatory evacuation of the city. Record-breaking temperatures, reaching 32.8 °C (91 °F), low relative humidity and strong winds contributed to the fire's rapid growth in forests affected by "an unusually dry and warm winter". More than 100,000 people in the city and surrounding region were evacuated. It was Canada's largest recorded wildfire evacuation in history and third-largest recorded environmental disaster evacuation behind the 1979 Mississauga train derailment and the 1950 Red River flood. About one-fifth of homes in the city were reported to be destroyed in the fire. Fort McMurray is 435 kilometres (270 mi) northeast of Edmonton on Highway 63, about 60 kilometres (37 mi) west of the Saskatchewan border, nestled in the boreal forest at the confluence of the Athabasca River, the Clearwater River, the Hangingstone River, and the Horse River. It sits at 370 metres (1,210 ft) above sea level. Fort McMurray is the largest community in the Regional Municipality of Wood Buffalo. White spruce, trembling aspen, balsam poplar and white birch are the most prominent native trees in and around town. Black spruce and tamarack occur in poorly drained areas and jack pine may be seen on the driest sites. European aspen, blue spruce and sand cherry are among the exotic trees occasionally seen. With severe winters except during periods of warming chinook winds, mild to warm summers and only three months whose average temperature is higher than 10 °C (50 °F), Fort McMurray has a borderline subarctic climate (Köppen: Dfc), very slightly below to be considered a humid continental climate (Dfb) as May averages 9.9 °C (49.8 °F); and falls into the NRC Plant Hardiness Zone 3a. Temperatures range from an average of −17.4 °C (0.7 °F) in January, to 17.1 °C (62.8 °F) in July. The average annual precipitation is 418.6 millimetres (16.48 in) and falls mainly in the summer months. Average annual snowfall is 133.8 centimetres (52.7 in), most of which falls between October and April. The highest temperature ever recorded in Fort McMurray was 38.9 °C (102 °F) on July 18, 1941. The lowest temperature ever recorded was −53.3 °C (−64 °F) on February 1, 1917 and December 31, 1933. Neighbourhoods in Fort McMurray include Abasand Heights, Beacon Hill, Eagle Ridge, Grayling Terrace, Gregoire, Lower Townsite, Parsons Creek, Prairie Creek, Saline Creek, Stone Creek, Thickwood Heights, Dickensfield, Timberlea, Waterways. In the 2011 Census, Fort McMurray had a population of 61,374 living in 21,729 of its 26,401 total dwellings, a 28.7% change from its 2006 population of 47,705. With a land area of 59.89 km2 (23.12 sq mi), it had a population density of 1,024.7791,024.8/km2 (2,654.1652,654.2/sq mi) in 2011. In the Canada 2006 Census, Statistics Canada recorded a population of 47,705 in Fort McMurray living in 19,021 dwellings, a 23.4% increase from its 2001 population of 38,667. It had a land area of 59.89 km2 (23.12 sq mi) and a population density of 796.5/km2 (2,063/sq mi). The same year however, the RM of Wood Buffalo counted a population of 64,444 in its municipal census, which included a shadow population of 2,301 living in hotel/motel and campground accommodations. The discrepancy in the results was attributed to differences in census methodologies where Statistics Canada used a de jure method while the municipality used a de facto method. Fort McMurray's permanent population in 2015 was 78,382 as counted by the RM of Wood Buffalo's 2015 municipal census. In addition, the census counted a shadow population of 4,342 non-permanent residents for a combined population of 82,724. The RM of Wood Buffalo's 2012 municipal census reported a population of 72,944 in Fort McMurray, which included permanent and shadow (non-permanent) populations of 70,964 and 1,980 residents. The 2012 census also indicated that Fort McMurray had 22,386 dwelling units, of which 47.4% were single detached houses (10,604), 27.7% were apartments (6,206), 9.6% were manufactured homes (2,141), 9.2% were townhouses (2,070) and 6.1% were semi-detached houses (1,365). The population of Fort McMurray was 76,797 according to the RM of Wood Buffalo's 2010 municipal census, which included a shadow population of 1,539 residents respectively. However, the 2011 Municipal Affairs Population List published by Alberta Municipal Affairs presents Fort McMurray's population as 64,773, which includes a non-permanent (shadow) population of 2,184 and its 2007 permanent population of 62,589. This is the second time that Alberta Municipal Affairs did not recognize the latest municipal census results published by the RM of Wood Buffalo. In 2008, the municipality's municipal census presented Fort McMurray's population as 72,363 (70,304 permanent and 2,059 non-permanent residents). However, the 2008 municipal census population was not accepted as an official population by Alberta Municipal Affairs due to the use of statistical extrapolation instead of 100% door-to-door enumeration. Therefore, the 2008 Official Population List published Fort McMurray's 2007 population, instead of its 2008 population, as the urban service area's official population for 2008. According to historic municipal census data, Fort McMurray experienced an average annual growth rate of 6.1% between 2000 and 2010. The RM of Wood Buffalo estimates the population of Fort McMurray to increase to 133,000 by 2028. Fort McMurray is a multicultural community, attracting people from all corners of Canada and the world. Generally, moves to Fort McMurray have increased in the last decade. Still, Albertans make up almost half the number of migrants to Fort McMurray, followed by 17% of people originating from the province of Newfoundland and Labrador. A report in 1986 noted that 13.8% of Fort McMurray's population was from Newfoundland. Fort McMurray is considered the heart of one of Alberta's (and Canada's) hubs of oil production, located near the Athabasca Oil Sands. Besides the oil sands, the economy also relies on natural gas and oil pipelines, forestry and tourism. Oil sand companies include Syncrude, Suncor Energy, CNRL, Shell, and Nexen. Fort McMurray's growth is characteristic of a boomtown. Housing prices and rents are far higher in Fort McMurray than one would expect in such a remote area. In 2006, Fort McMurray had the highest prices in Alberta. The Alberta government has promised to release more Crown land for residential construction, particularly in Timberlea on the north side. Fort McMurray International Airport (ICAO Code CYMM, IATA Code YMM) is serviced by Air Canada, Air Canada Express, Integra Air, McMurray Aviation, Sunjet, Northwestern Air, WestJet and WestJet Encore, with scheduled flights to Calgary, Edmonton, Fort Chipewyan, Fort Smith, Lethbridge, Peace River, Saskatoon, Toronto and Vancouver. The airport is also serviced by various oil companies with corporate and charter flights. Flights are frequently booked to capacity because of the high transient worker population and people unwilling to drive on Highway 63. Wood Buffalo Transit operates in the community, with routes that extend to all subdivisions on the south side and subdivisions on the north side. Recently Wood Buffalo Transit has expanded their service to the Fort McMurray International Airport and the northern industrial park, Taiga Nova. Ebus and Red Arrow operate scheduled passenger bus services to Edmonton and other communities along Highway 63, as well as other destinations farther south. Highway 63 is the only highway between Fort McMurray and Edmonton. Due to the industrial demands of the oilsands, Highway 63 boasts some of the highest tonnage per kilometer in Canada, and the largest and heaviest loads that trucks have ever carried. Highway 63 was fully twinned in May 2016. Highway 881 also provides access to the region from Lac La Biche. Canadian National discontinued the Muskeg Mixed (mixed train) to Fort McMurray in 1989, and there has been no passenger rail service since. CN continues to operate freight service on its line to Lac La Biche and points beyond. Canada Post identified Fort McMurray as "having a particularly high cost to serve" in January 2014, and planned to institute a surcharge of $5.00 for all parcels shipped to the area. However, the postal service retracted this decision before the rate change went into effect. The Fort McMurray Public and Catholic School Districts both serve the Primary, Elementary, and Secondary Education needs of students in Fort McMurray. Each school district offers diverse programs like French immersion, performing arts or a dedicated technology and science lab, however only FMPSD offers the Advanced Placement program at one of their schools, being Westwood Community High School. On Abasand Drive, École Boréal is the only francophone school in the area and goes from pre-kindergarten to Grade 12. Keyano College is a publicly funded college and vocational institute based in the area and plays a role in training workers for the oil sands. Known as the cultural hub of the Regional Municipality of Wood Buffalo, Keyano College contains both a state-of-the-art theatre and recital hall, hosting a variety of musical and theatrical events that attract upwards of 50,000 visitors each season. Local teams include the Fort McMurray Oil Barons of the AJHL, the Fort McMurray Giants of the WMBL, and the Keyano Huskies of the ACAC. ^ Based on station coordinates provided by Environment Canada, climate data was recorded in the lower town site area of Fort McMurray from June 1908 to November 1944 and at Fort McMurray Airport from January 1944 to the present day. ^ a b "Fort Mac right to cry 'Enough!'". Archived from the original on March 25, 2007. ^ ""No country for young men"". March 29, 2012. Retrieved May 8, 2016. ^ Keith Gerein (April 4, 2012). "Highway 63 twinning vital issue in Fort Mac". Edmonton Journal. Postmedia Network. Archived from the original on April 5, 2012. Retrieved June 5, 2012. ^ a b c "Census Profile, 2016 census". Retrieved November 2, 2017. ^ a b "Annexation History". Virtual Museum of Canada. Retrieved November 2, 2014. ^ a b "Location and History Profile: Regional Municipality of Wood Buffalo" (PDF). Alberta Municipal Affairs. June 17, 2016. p. 30. Retrieved June 18, 2016. ^ a b c d "Census Profile – Fort McMurray, Alberta (Population Centre)". Statistics Canada. February 8, 2012. Retrieved February 8, 2012. ^ a b 2015 Municipal Affairs Population List (PDF). Alberta Municipal Affairs. ISBN 978-1-4601-2630-1. Retrieved February 23, 2016. ^ "2010 Municipal Codes" (PDF). Alberta Municipal Affairs. April 1, 2010. Retrieved July 19, 2010. ^ "Specialized and Rural Municipalities and Their Communities" (PDF). Alberta Municipal Affairs. April 1, 2010. Archived from the original (PDF) on February 29, 2012. Retrieved July 10, 2010. ^ a b "Location and History Profile – Regional Municipality of Wood Buffalo". Alberta Municipal Affairs. February 2, 2010. Retrieved February 8, 2010. ^ Frits Pannekoek. 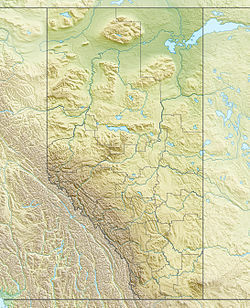 "Fort McMurray – The Canadian Encyclopedia". Thecanadianencyclopedia.ca. Retrieved May 8, 2016. ^ Fort McMurray, Alberta, Canada. Fort McMurray: Board of Trade. 1915. Retrieved May 9, 2016. ^ Alberta Culture and Tourism. "Abasand". ^ "1985 Official Population" (PDF). Alberta Municipal Affairs. Retrieved February 3, 2011. ^ "1989 Official Population" (PDF). Alberta Municipal Affairs. Retrieved February 3, 2011. ^ Ian Austen (October 12, 2015). "Oil Sands Boom Dries Up in Alberta, Taking Thousands of Jobs With it". The New York Times. Retrieved October 13, 2015. ^ "Wildfire destroys Fort McMurray homes, most of city evacuated". CBC News Edmonton. May 3, 2016. Retrieved May 3, 2016. ^ a b Parsons, Paige (May 3, 2016). "Thousands flee from Fort McMurray wildfire in the largest fire evacuation in Alberta's history". Postmedia Network. Edmonton Journal. Retrieved May 3, 2016. ^ "Daily Data Report for May 2016". Environment Canada. May 6, 2016. Archived from the original on May 6, 2016. Retrieved May 6, 2016. ^ "Fort McMurray and the Fires of Climate Change". The New Yorker. May 5, 2016. ^ a b Canada wildfire: 20% of Fort McMurray homes destroyed, says MP, BBC (May 8, 2016). ^ a b Andrew V. Pestano, Official: About 20 percent of Fort McMurray homes destroyed in wildfire, UPI (May 9, 2016). ^ Angela Fritz, Fort McMurray wildfire evacuation was largest on record in Canada, Washington Post (May 4, 2016). ^ Jaime Weinman (May 4, 2016). "What were Canada's biggest mass evacuations?". Maclean's. Rogers Media. Retrieved December 15, 2017. ^ "Plant Hardiness Zone by Municipality". Natural Resources Canada. Government of Canada. Retrieved May 7, 2016. ^ "Daily Data Report for April 1980". Climate Data Online. Environment Canada. November 2012. Archived from the original on February 19, 2013. Retrieved February 3, 2013. ^ a b "Fort McMurray Airport, Alberta". Canadian Climate Normals 1981−2010. Environment Canada. Retrieved October 4, 2013. ^ a b "July 1941". Canadian Climate Data. Environment Canada. Retrieved March 21, 2016. ^ a b "February 1917". Canadian Climate Data. Environment Canada. Retrieved March 21, 2016. ^ a b "December 1933". Canadian Climate Data. Environment Canada. Retrieved March 21, 2016. ^ a b "Ft McMurray". Canadian Climate Data. Environment Canada. Retrieved March 21, 2016. ^ "Fort McMurray Airport, Alberta". Canadian Climate Normals 1981−2010. Environment Canada. Retrieved October 4, 2013. ^ "April 1939". Canadian Climate Data. Environment Canada. Retrieved June 9, 2016. ^ a b c "Regional Municipality of Wood Buffalo Municipal Census 2012" (PDF). Regional Municipality of Wood Buffalo. October 2012. Retrieved December 10, 2012. ^ "The Municipal Census 2015 Report" (PDF). Regional Municipality of Wood Buffalo. 2015. Retrieved June 22, 2017. ^ "Table 16: Population and Dwelling Counts, for Urban Areas, 1991 and 1996 Censuses – 100% Data". 96 Census. A National Overview – Population and Dwelling Counts. Ottawa: Statistics Canada. 1997. pp. 184–198. ISBN 0-660-59283-5. ^ "Population and Dwelling Counts and Population Rank, for Canada, Provinces and Territories, and Urban Areas, 2001 Census – 100% Data (Alberta)". Statistics Canada. p. 5 of 5. Retrieved April 2, 2012. ^ a b "Population and dwelling counts, for Canada, provinces and territories, and urban areas, 2006 and 2001 censuses – 100% data". Statistics Canada. January 6, 2010. Retrieved February 2, 2011. ^ "Municipal Census 2006" (PDF). Regional Municipality of Wood Buffalo. 2006. Retrieved July 19, 2010. ^ Pratt, Sheila (July 2, 2012). "Federal census missed thousands of residents, Fort McMurray's mayor says". Postmedia Network Inc. Edmonton Journal. Retrieved May 9, 2016. ^ a b c Alberta Municipal Affairs (January 17, 2011). "Regional Municipality of Wood Buffalo Municipal Census 2010" (PDF). Retrieved January 17, 2011. ^ "2011 Municipal Affairs Population List" (PDF). Alberta Municipal Affairs. October 5, 2010. Retrieved December 12, 2011. ^ RM of Wood Buffalo (July 15, 2009). "2008 Municipal Census Report" (PDF). Retrieved February 14, 2009. ^ RM of Wood Buffalo (July 15, 2009). "Wood Buffalo's population passes 100,000, reports 2008 Municipal Census". Archived from the original on August 28, 2010. Retrieved February 14, 2009. ^ Fort McMurray Today (July 16, 2009). "Wood Buffalo hits 100,000, but province not paying up". Archived from the original on July 11, 2011. Retrieved February 15, 2009. ^ "2007 Official Population List" (PDF). Alberta Municipal Affairs. May 26, 2008. Retrieved February 2, 2011. ^ "2008 Official Population List" (PDF). Alberta Municipal Affairs. September 15, 2008. Retrieved February 2, 2011. ^ "Moving Company Fort McMurray". Matco Moving Solutions. Manitoulin Group. Retrieved November 26, 2015. ^ "Envision Wood Buffalo" (PDF). Fort McMurray – Where We Are Today. Regional Municipality Of Wood Buffalo. Retrieved November 26, 2015. ^ "Fort Mcmurray Popular With Newfoundlanders". The Calgary Herald. January 3, 1986. Retrieved April 17, 2012. ^ "Wood Buffalo Transit". Regional Municipality of Wood Buffalo. Retrieved July 14, 2012. ^ Fort McMurray Tourism. "Fort McMurray Tourism". Retrieved January 30, 2008. ^ "Parcel Services Price and Service Overview of Changes" (PDF). Canada Post. Retrieved January 6, 2014. ^ "Canada Post cancels parcel surcharge in Fort McMurray". CBC. Retrieved January 16, 2014. ^ Pottie, Erin (April 15, 2014). "Mabou cartoonist draws on memories of Fort McMurray". thechronicleherald.ca. Herald News. Retrieved February 2, 2015. Wikimedia Commons has media related to Fort McMurray, Alberta.